← Pictures from the past. These are photos of some of the wildlife found in our garden. Squirrel at the bird feeder. Running on the (fence) highway. Squirrel on the snow-covered fence. View or comment on Tok’s Blogspot Blog. This entry was posted in Alberta, Animals, Animals, Calgary, Canada, garden, nature, Photos. Bookmark the permalink. 6 Responses to Wildlife in our garden 1. Love the photo’s. Our weather is crazy here in SA. Winter cold and heatwaves. Bees in the birdfoid. All signs of nature in crisis. 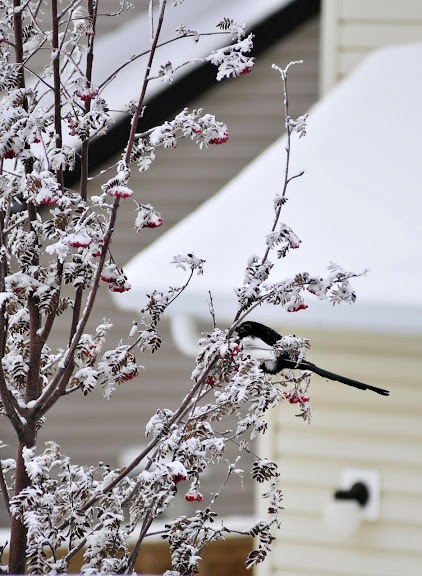 We also had a very hot summer, in the first week in October Calgary’s snowfall was the seventh heaviest for any day in Calgary’s weather records dating to 1881, according to a tweet from YYC Weather Records. Dis pragtige fotos Linda. Die natuur is darem wonderlik nè? Baie dankie Hester, ons moet maar soms vinnig speel met die kamera, hulle is al permanent op die eetkamer Buffet-kas. Wordpress se klokkie werk ook nie aldag nie en my Yahoo notifikasies gaan soms in ‘n ander “”folder” in. Wow awesome to have that in your garden.. I think it is mainly due to the trees that we planted and the bird feeders.